Notes This image is part of the german TBG-Project ("Tief-Belichtete-Galaxien") that aims to find missing satellite galaxies and merger streams around nearby galaxies. This is - so far - my personal record for accumulating exposure time for a non-mosaic image. 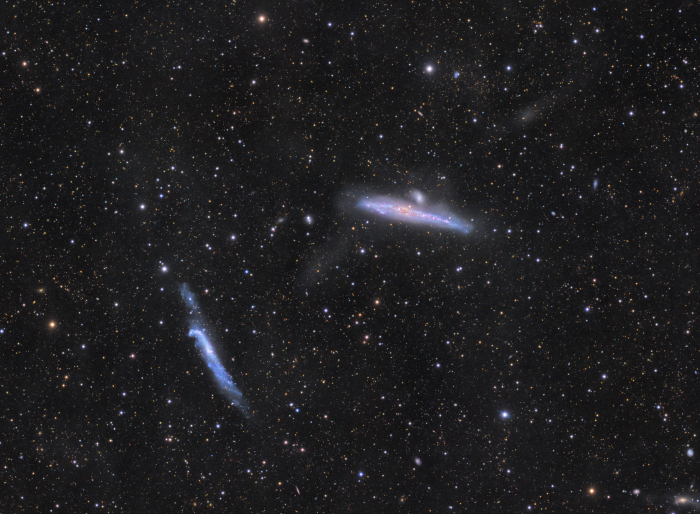 My goal here was to get a good image depth to reveal possible faint structures associated with the galaxies. Besides these low surface brightness objects there are also numerous background galaxies (and quasars) at respective distances of up to redshifts of z = 4.5, which corresponds to distances of up to 12 Billion lightyears! 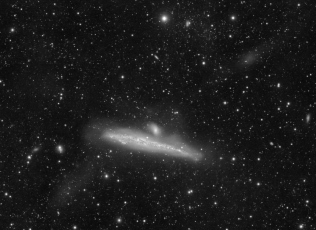 150% resolution images of PGC 42283 with interesting interacting structures, and the whale galaxy, NGC4631, are given below. 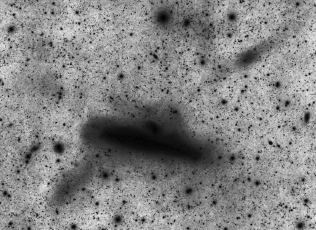 The total luminance image (2970 minutes) is shown below. The image to its right is an inverted and contrast stretched version for better visibility of the faint structures. Click on each to find a larger version.